Health and safety are typically at the top of our list of concerns when processing food. This is why the food industry has such strict requirements in the United States. These businesses are also concerned with other areas such as business operations, loss reduction and regulatory compliance. The many challenges of these requirements include insufficiently regulated systems and continual changes to production practices in food processing. These challenges are driving the need for improvements and advancements in video technology offer a range of benefits for food processing. Video surveillance has been commonly used in food processing for decades to prevent theft and contamination. The degree of implementation and level of sophistication of this technology varies greatly with some businesses still using traditional analog video systems that typically consist of a camera connected to a monitor via coaxial cable and a DVR or other onsite recording device. Most food processors today are migrating toward intelligent video surveillance that includes an Internet Protocol (IP)-based system. An IP camera, or netcam, sends and receives video data in digital format via the Internet. This is a different process than using analog CCTV (closed-circuit television) cameras. IP cameras technically include webcams, although this term generally isn’t used when the camera is deployed for surveillance. The recording from an IP camera can be directly accessed with a network connection. The shift to digital technology in video surveillance design is occurring in all markets, although, food processors have been slower to adopt it than other industries like city surveillance and education. The primary reason for this difference is that the food industry is generally slow to adopt any new technology. Security camera systems also offer capabilities that provide compelling benefits for businesses in general and food processing in particular. Video surveillance has general applications in daily business operations such as monitoring the efficiency of line staff. In food production, it’s useful for identifying potential hazards such as cross-contamination and compliance breaches with harvesting and slaughtering. A high-definition security camera can also be used operationally for training new employees to correctly perform procedures. AP teams are looking for partnerships with solution providers to help them use new technology more effectively. This trend is especially beneficial for operations, as shown by a survey from the Loss Prevention Research Council (LPRC), which indicates that 93 percent of respondents who have used video for cross-functional purposes have observed operational benefits. IP video can also help operations by driving sales and improving customer service. This process often involves analyzing the same data other departments in an organization have been using for years. This is done by simply interpreting the existing data for a new purpose. For example, an operations staff member can use security footage to count people, which is important for understanding the effectiveness of store displays and promotions. Video recordings can also help operations managers design more efficient floor layouts and staff schedules. They can also use this data to estimate metrics like end cap effectiveness, customer/labor count ratios, service counter efficiency and sales conversion rates. If these analytics are performed in near real time, managers can even reassign staff members to meet changes in demand before complaints arise if these analytics are performed in near real-time. A survey conducted by Axis Communications and FMI shows that operations teams use video surveillance to perform other tasks, including monitoring temperature of coolers and freezers, conducting food safety audits and reviewing direct store delivery (DSD) procedures. Food processors and manufacturers have long used video surveillance for loss reduction. This tool, however, is becoming increasingly important for understanding the causes of those losses. The AP teams at these businesses are also finding more ways to leverage surveillance systems for this purpose. This includes using video footage to perform exception-based analysis. Video systems are also increasingly likely to be used for monitoring organized retail crime (ORC) activity such as product sweeping. More advanced video technologies such as cross-line detection and motion detection are being used with greater frequency. This is most often the case most often for high-theft items. Food processors are also more likely to use these systems for physical security, especially for enforcing of food safety policies. AP team members can use video surveillance to monitor suspicious behavior with auto-tracking. This info can be used to send an alert to an operator and enable proactive intervention. Food retailers can also use footage with VMS to monitor checkouts. This can help prevent bottom-of-basket losses and scams such as sweet-hearting and self-checkouts. The integration of video with point-of-sale (POS) devices allows managers to associate a specific video event with a POS transaction. This can reduce the time needed to review a purchase. Retailers are also integrating video surveillance with electronic article surveillance (EAS). This uses a tag to sound an alert when a customer takes unpaid merchandise out of the store. EAS was originally developed to prevent loss of books and other printed materials, but has been adapted for other items. Video surveillance consulting services benefit vendors. Video surveillance consulting services can also benefit vendors on the premises, either as a standalone or cloud-based solution. These services are often used by hypermarkets, which include vendors such as banks, quick service restaurants (QSRs) and coffee shops. In these cases, video surveillance services can be offered as part of a sublease. HD video surveillance makes video recordings more useful in legal proceedings. The proliferation of HD video surveillance is also making video recordings more useful in legal proceedings. The evidentiary value of video lies primarily in the prosecution of shoplifting cases. However, it may also record crimes not directly related to loss reduction. Partnerships with law enforcement agencies help leverage video for investigative purposes, including live monitoring during crisis situations and false alarms. IP video also allows managers to perform audits of multiple stores remotely without the need to travel to each store. Changes in diets require food processors to adopt more varied food production techniques. The type of food we eat is clearly changing, due in part to shifting demographics. This affects public preferences and ingredients, including a greater demand for quality. These new diets require food processors to adopt more varied production techniques with an increased focus on preventing foodborne illnesses. The World Health Organization (WHO) reports that over 200 diseases can be transmitted through food. This has caused ten percent of the world’s population to fall ill and 420,000 fatalities each year from contaminated food. Complex food supply chains increase chances of contamination. The WHO has also identified many ways for food to become contaminated, especially with the longer supply chains that are becoming more common. Complex supply chains have many stages before food reaches its consumers, including slaughtering, harvesting, processing, transport, storage and distribution. Each link in this chain represents a unique opportunity for contamination, creating challenges for all business in the food industry. Food is a perishable commodity that’s in a constant state of decay from the time it comes out of the ground or slaughterhouse. It therefore comes closer to spoiling as it moves through the supply chain, regardless of the precautions taken to prevent this from happening. The risk of contamination, damage and mishandling also increases as more people come into contact with food. Furthermore, the number of storage facilities increases as food nears the end of its supply chain, creating multiple opportunities for inadequate storage temperatures. Food safety therefore requires careful management through surveillance. Exposure is particularly difficult to control in grocery stores, where customers can handle food and replace it on the display. This practice may be unavoidable, but it still results in additional damage and contamination. Today’s video cameras can run on an existing network, allowing managers to review images quickly and easily. They can also share these images with a broader audience, so data can be corroborated with other technologies such as access controls, alarms and POS systems. Furthermore, IP cameras allow all levels of management to view video, since remote access and on-site access are equally convenient with this technology. Store managers, regional managers and corporate managers can all review this material from different access points, depending on their particular requirements. Network video thus ensures that each location is consistently following a company’s food safety procedures. Quality assurance (QA) team members can also improve food safety with the proactive use of video, especially in QSR environments where many employees handle food at the same time. Video cameras can be positioned at key locations in the food preparation area, allowing management to identify potential areas of improvement in procedures, QA and training. Video can be used similarly in grocery stores, especially in the preparation of raw meat where sanitation requirements are particularly strict. Produce placement provides another opportunity for video by ensuring that displayed produce is replaced as needed. This use of video can also save a business time and money in the long run by improving the efficiency of food preparation. Education and training remain the cornerstones of food safety, but increased globalization is creating new challenges in the regulation of food manufacturing and processing. The growing number of geographic locations and longer supply chains in the food industry also increase the risk of disease outbreaks and product recalls. Businesses in this industry must also cooperate with regulatory organizations such as the Food and Drug Administration (FDA) in the U.S. The FDA also has the authority to investigate food-borne illnesses and determine how an outbreak occurred. 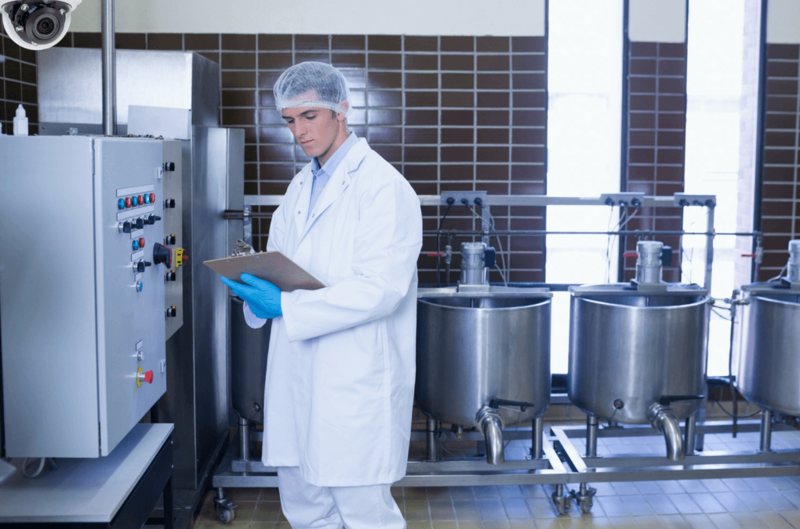 Food production facilities must therefore provide the FDA with information in support of these investigations, which is often a complex process. The FSMA increases FDA’s authority over growing, harvesting, and processing of food. When it was enacted in 2011, the Food Safety Modernization Act (FSMA) greatly increased the FDA’s regulatory authority particularly with regard to the growing, harvesting and processing of food. In particular, the FSMA allows the FDA to issue mandatory recalls, a power it had sought for many years. The FSMA also requires the FDA to issue various rules and guidelines each year. Passage of the FSMA was largely prompted by a series of foodborne illnesses that occurred in the U.S. between 2000 and 2010, which cost the food industry billions of dollars in lost sales and legal expenses. It was primarily crafted by the Grocery Manufacturers Association (GMA) and modeled after the Food Safety Enhancement Act (FSEA), which passed the U.S. House of Representatives in 2009. The FSMA is the most important legislation to address food safety since the Food, Drug and Cosmetic Act was passed in 1938. The FDA updated its registration system for food facilities in 2012, which required all facilities registered before that date to renew their registration under the new system. Registered facilities must also renew their registration by fax, mail or the FDA’s website between October and December every two years. Failure to do so results in a number of sanctions, including the prohibition of trade and importation of food products into the U.S. The FDA recognized nearly 200,000 registered food facilities as of 2014. Video surveillance has many applications in FDA regulatory compliance, especially in the area of physical security. This capability is particularly useful for monitoring access to food storage facilities while they’re in use, which can be integrated with alarms and intrusion detection systems. However, video surveillance of these facilities must also comply with privacy laws, which can restrict the placement of cameras in the workplace. The storage and use of toxic chemicals provide other opportunities for regulatory compliance and the need for video surveillance in the food industry. These businesses often store cleaning agents and pesticides on site, which pose a source of contamination for food products. Video surveillance can help secure the storage of chemicals that aren’t available for sale, especially when combined with access control devices such as cipher locks and key cards. Many key shareholders should be involved in the process of designing a video surveillance solution for a food manufacturing plant, including facility managers, supply chain managers, and health and safety managers. A physical security consultant with experience in food manufacturing is particularly useful for delivering a surveillance system that improves the safety, security, business intelligence and operational effectiveness of a food manufacturing plant. The ability of such a system to deliver a rapid forensic analysis for investigations and training procedures is a vital component of safety and security for these businesses. A video surveillance system is also an important investment for improving the business intelligence and operational effectiveness of a large manufacturing plant. The combination of correct camera placement and intelligent video analytics allows managers to improve staffing downtime, production efficiency, ingredient protection and supply chain management. We are security system design experts who bring the best value to commercial or government clients. Your time is valuable - see if we are a strong fit by scheduling on your calendar 1 of our 4 categories of meetings. If nothing else you'll walk away armed with more information to make better business decisions.